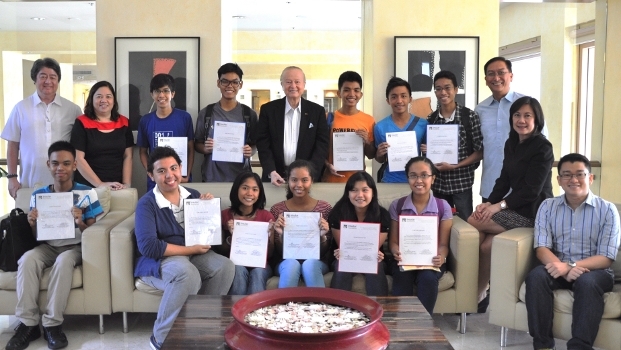 Insular Foundation recently gathered its eleven new Gold Eagle Scholars for an orientation and formal presentation to the Foundation Board of Trustees. The scholars are all University of the Philippines - Diliman freshmen. Nine are enrolled under the Bachelor of Secondary Education, while two are under the Bachelor of Science in Mathematics degree programs. Foundation Program Manager Tere Melad briefly introduced the Foundation background and its other programs, while Project Officer Kristine Michelle Tingzon discussed the Gold Eagle scholarship rules and requirements. The scholars also signed an After Graduation 2-Year Service Requirement, which commits them to teach in any school in the Philippines for at least two years from the date they graduate. After the briefing, the Insular Foundation Board led by its Chairman and CEO Vicente R. Ayllón hosted an intimate luncheon for the new batch of Scholars at the Palms Country Club. The scholars were officially presented as bonafide Gold Eagle Scholars of the Insular Foundation. The scholarship benefits include full tuition and miscellaneous fees, stipend, transportation and book allowance, provided they meet the minimum grade requirement. The Insular Foundation is currently supporting 33 scholars taking up BS Elementary or Secondary Education and 4 scholars taking up BS Mathematics in the University of the Philippines – Diliman, six of whom are expected to graduate by the end of the current school year.